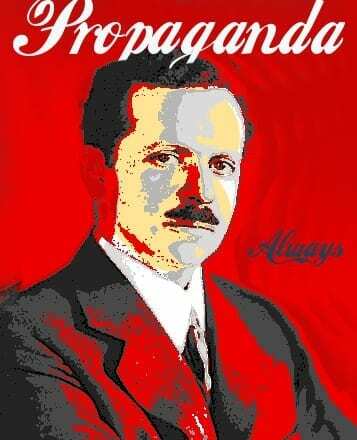 Bernays affiliation with his kin, Freud, helped him establish his credentials as a manipulator. Both are under siege by the forces of the government of that country. Both cities are occupied by fanatics, who commit terrible atrocities, such as beheading people. In the second city – in another country nearby – almost exactly the same is happening. Government forces are laying siege to a city controlled by the same breed of fanatics. When the terrorist atrocity happened in Paris last November, President Francois Hollande immediately sent planes to bomb Syria – and more terrorism followed, predictably, the product of Hollande’s bombast about France being “at war” and “showing no mercy”. That state violence and jihadist violence feed off each other is the truth that no national leader has the courage to speak. Propaganda is most effective when our consent is engineered by those with a fine education – Oxford, Cambridge, Harvard, Columbia — and with careers on the BBC, the Guardian, the New York Times, the Washington Post. Intervention — what a polite, benign, Guardian word, whose real meaning, for Libya, was death and destruction. This inversion of reality is so pervasive that Washington’s military intimidation of Russia is not news; it is suppressed behind a smear and scare campaign of the kind I grew up with during the first cold war. Once again, the Russkies are coming to get us, led by another Stalin, whom The Economist depicts as the devil. There is almost the joie d’esprit of a class reunion of warmongers. The drum-beaters of the Washington Post inciting war with Russia are the very same editorial writers who published the lie that Saddam Hussein had weapons of mass destruction. This is adapted from an address to the Sheffield Festival of Words, Sheffield, England. ALL IMAGE CAPTIONS, PULL QUOTES AND COMMENTARY BY THE EDITORS, NOT THE AUTHORS • PLEASE COMMENT AND DEBATE DIRECTLY ON OUR FACEBOOK GROUP. CLICK HERE TO VISIT. Speaking of propaganda, nothing is as ridden with clumsy lies as the US television cable networks. Parts of that problem is of course because the so-called journalists or ’commentators’ have been indoctrinated up to their numb skulls and are not even aware of their prefabricated opinions, trying to transfer these with varying convictions to an unaware public. Such a medium is easily influenced as is often seen by foreign manipulations. One such example is without doubt the smart statesman Putin who praises Trump, knowing full well that the appearance of support by him who is seen by the US establishment as the representation of of evil may sink Trump’s candidacy and will insure that there will be a president Clinton II, who is easily manipulable by such as Putin. Who knows, she may even see his soul when staring at him with her blue peepers….